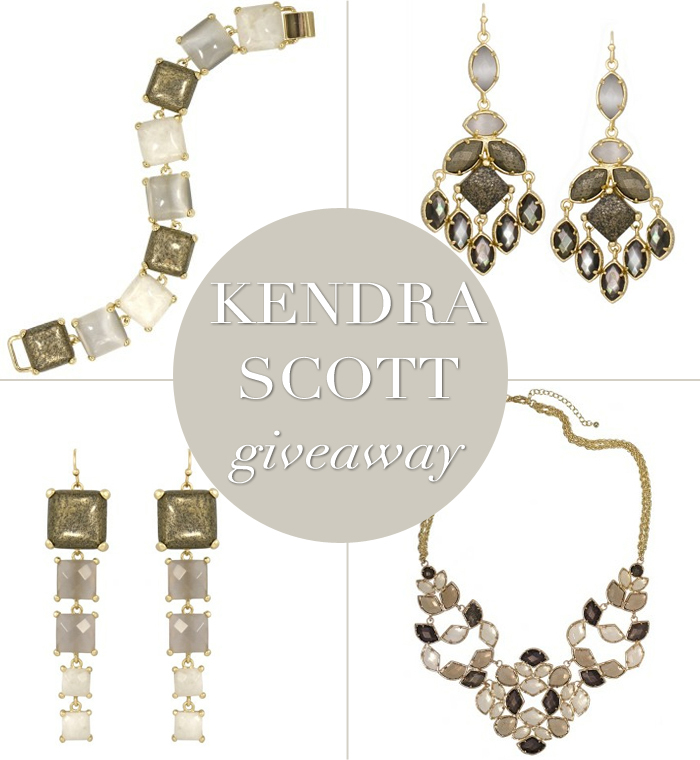 I’m excited to announce that I’ve partnered with Kendra Scott for a lovely holiday giveaway! Enter to win a $100 gift card to KendraScott.com, perfect for picking up those last minute stocking stuffers or a little holiday treat just for you! All you have to do is comment on this post with the #1 item on your holiday wish list and your email (to contact the winner). For an extra entry, follow Kendra Scott and The Style Scribe on Twitter! Deadline for entries is Thursday at midnight CST! I love the “Sam Neclace” in green. Great for Baylor games. Sic Em and fingers crossed. I really really love the Danielle earrings- in any color really! I’d love to have them all! They are so gorgeous. I also follow you both on twitter. I’m a huge fan of Kendra Scott! I’ve been lusting after the gold feather earrings & could use the gift card to help buy some Christmas gifts!! I would love to find Kendra Scott’s Marcella Statement Necklace in Black under my tree! Thanks so much! The Danielle earrings and Sam necklace are both great pieces! I also have a new black purse and brown boots on the top of my wish list! YAY! This is so exciting! I love the June earrings in green! So chic for holiday! OH: And I followed Kendra on twitter… I’ve been following you for a while now! :) Happy Holidays, Merritt! On my list this year are the Maxine long earrings in vouge. Or the Lotus earring above are fabulous as well! Either would be perfect for the thing at the top of my list: a trip to Miami to see my alma mater play in the National Championship game! Roll Tide & Merry Christmas!! LOVE the Harlow necklace in Slate!! I love it all! I’m really lusting after a big pair of statement earrings for Christmas! I love the Estelle Statement Necklace in Jazz. So pretty! I really want an iPad this year! These pieces are gorgeous! lorraine chandelier earrings in slate! Love the skylar earrings in black! Absolutely adore the Lora Metallic Ring in Gold! Following you both on Twitter as well :) Thank you for this fabulous giveaway! Love the Rayne necklace in Lilac! great stuff! i’d love to win! and i’m really hoping for a plaid skirt, i just can’t get enough of plaid for the holidays!! I love the Grayce necklace in pebble so much! I will be a bride this summer and black and silver are two of our accent colors, when I saw this necklace I knew I had to wear it on my special day!! It is the finishing touch! Skyler or Elle earrings in black or one of her great statement rings in any color! PS- I’m a Twitter follower! I love any and all of Kendra Scott’s earrings! The #1 item on my list is a Michael Kors Handbag. Thanks for a great giveaway! I’m following Kendra Scott on Twitter! I love the June Long Earrings in green! I am already a follower of the style scribe on twitter – love your blog! I’ll take the lorraine earrings! So pretty! Everything is so beautiful, but I really love the Grayce Statement Necklace in Petal! Such a great giveaway! I love the Harlow Statement Necklace in Goldstone so that is definitely #1 in my wishlist. I love the Marcella Necklace in slate. It’s gorgeous. Thanks for the great giveaway! I love the Harlow Statement Necklace in Tigers Eye. I love all of Kendra Scott’s jewelry, but I especially love the Sandy Necklace in Gold right now! It’s awesome. Love the Starla Earrings in green! I love the Beth necklace in Tigers Eye! I’d love the Maitlyn earrings in green that Mindy Kaling sported in the Thanksgiving episode of the Mindy Project. I love the Della earrings in green. They are the perfect holiday hue! I would love the “Cortland” earrings in slate! I also follow you and Kendra Scott on twitter! The Danielles in White would be my pick :) Gorgeous! Following Kendra Scott on Twitter, too! I absolutely love the Elle earrings in black! I’m also a follower of Kendra Scott on Twitter! Love the Morgan stud earrings — especially in turquoise! I love the Maxine Long Earrings in Starlet! I looove the Danielle earrings in emerald!! I follow you both on twitter!! I am such a huge fan of The Danielle earring! I would love to try the new slate color or go all out and get the Gloria Chandelier earring. Swoon! All of Kendra Scott’s jewelry is amazing, especially her earrings! I die for the “Skylar” style in any color! Love the Cassie bracelet in turquoise!! Love love love Kendra Scott , I’ve wanted the golf cuff for so long ,it would finish off any outfit with a bang ! I’m also following you both via @bedknobsbaubles on Twitter. I just love Kendra Scott! Her colors are great and the pieces are fun but easy to wear. My #1 pick for my holiday list is the sam neclace in turquoise. it’s fun and would go with so much but isn’t too funky so i can wear to work. I would love the Lex studs in green. They are so simple and would go great with so much! Kendra and Merritt are my fashion inspirations! My #1 wish list item is the Faye necklace in Slate. Boho chic from work wear to tees! I would happily wear the Paulina Cocktail Ring in Berry. Following both twitter accounts. Thank you! I love it all! But I am a sucker for a sparkly pair of earrings. I love the Jean Pendant Necklace in Black!! I seriously want everything! It’s so hard to pick just one! I’m loving the Thalia necklace! It’s a great statement piece and definitely on my wishlist! Loving this giveaway! I’m loving the new Della earrings in both slate and green. Green would be perfect for the holidays! Also, I follow The Style Scribe and Kendra Scott on Twitter already. Pashli satchel is # 1 on my list. Would love me some Kendra Scott as well! My #1 item on my Christmas list are the Danielle earrings in Rose. LOVE them, I would wear them everyday! They are absolutely DIVINE! bwolters922@yahoo.com and I am following you both on twitter! LOVE Kendra Scott!! I would love to win the Danielle earrings in Lilac to give to my mom for a Christmas gift. She really deserves it this year; she has worked so hard! I also followed you both on twitter!! I would love the Skylar in lilac- I love my two pairs of Danielles! Thanks for hosting. I’m obsessed with the Viola chandelier earrings in Starlet!! They’re definitely on my wish list. I love the Harlow Statement necklace in every color! So pretty. I also followed both of y’all on Twitter! I love the Danielle earrings! If it were in my stocking this year…the harlow necklace in any color would be my go to necklace for a little pizazz for years to come! A girl can wish! Cassie Bracelet in Slate is on the top of my list… So the Jana in Tiger’s Eye. Valencia Necklace in Tigers Eye would be a dream! My #1 Wish List item is the Danielle Earrings in Goldstone to wear to the Alamo Bowl this December. the Elle Earrings in Lapis are at the absolute top of my list right now. i’m so excited for the holidays! I’d love to have the new gold bracelet with black jewel!!! The Danielle earrings in white! I’d definitely have to say the ‘Abena Cuff Bracelet’ in green! It’s a must have for me this holiday! Love Kendra Scott and that she is from Austin! I love the Danielle earrings in Turquoise! I would love the Grayce Statement Necklace in Petal. Love Maxine long earrings in vouge. Perfect holiday gift for myself or my sissy! Obsessed with the new Della earrings in black! My #1 item on my holiday wish list is a trip to Spain to visit my sister (my best friend) who has been living and working over there for the past year. I want everything!! I love designing jewelry in the Color Bar. But I’m really excited about the Spring Collection from some of the previews I have seen. I would love some ‘Danielle’ earrings in beautiful turquoise! I’ve always wanted the Harlow necklace in slate! I also follow both of ya’ll on twitter! I love your blog and, of course, Kendra Scott! At the top of my wish list are the Darby earrings from The Color Bar! The large part is black onyx and the small stone is clear amethyst. This is the perfect combo of soft and edgy! At the top of my list are the gorgeous Darby earrings in black! I am such a sucker for anything with a tassel so I’ve been eyeing the Rayne Necklace in Turquoise! Followed you and Kendra Scott on Twitter. I love the Jordana bangles in Gold, but I would really like to get a gift for my Mom – either the Jeanine Dangle Earrings or Dottie Long Necklace in Starlet. I really want a tablet/kindle for myself! I love the Grayce statement necklace! I love the Coco bracelet in black. It is super fun and great for the holidays! What a coincidence, I’ve got some nice jewelry on the top of my list! I love the concept of her shop and like a range of the pieces from simple (Tavi studs) to statement necklaces like the Nina. The Coco Bracelet in Slate is what I want. I love gold and grey as a combo and I need more bracelets in my jewelry collection. I really really really want a Cartier Tank Watch however The Elle Earrings are #2! I am also following Kendra Scott on Twitter! And i’m also following The Style Scribe on Twitter! I would love the Paulina Cocktail ring in Black! I already got a heavy duty coat for Chicago winters as an early Christmas gift, but I’m hoping for some KS jewels! I follow Kendra on twitter! The Marcella necklace is on my wish list!! Love it! I follow Kendra on Twitter (@BeautyMustsMom)! My #1 item for me this year is the Harlow necklace. I have been obsessed with it ever since it came out. A genuine unique true staple for any wardrobe.